A lot of you have probably been wondering why we haven’t announced any events lately. That’s because we have been working on something really fun. I am happy to finally go public with StartupNorth, the Conference. David and I wanted to create something that would give us all a place to come together, connect, learn and that we would all walk away from feeling inspired. We will be making announcements here over the next few months as we get closer to the conference. We are still working on bringing on more great speakers and a day of pragmatic, hands-on, workshops. We are going all out to give you a world-class conference right here at home, and we will be asking you for your help, a lot. In the next few days and weeks we will taking your votes on what sessions and workshops you want to see and really need.
? Asessing your market opportunity ? Why should I use your product?
? Product Design ? First customers and other business development pitfalls? 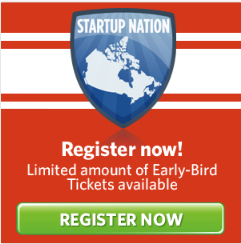 Day 2: Networking, speakers and in-depth panels with a focus on Canada’s role in the international startup ecosystem. Can’t wait to see you there, this is going to be fun! Hahahaaa… $300 for tickets… Is this for startups? Good luck but I won’t be seeign you there. Hahahaaa… $300 for tickets… Is this for startups? Good luck but I won't be seeign you there. Sounds great Jevon, I’ll pick up a ticket soon. I have been through the Devils Playhouse once before and it should be a good venue for this type of thing. Sounds great Jevon, I'll pick up a ticket soon. * We can’t do everything for free. Democamp, startupcamps, social events,. who do you think organizes this stuff? Go try it some time and see how much work it is, and then you’ll realize that 300$ doesn’t even cover the costs of putting it on. You are clueless. * There will be a program to help get tickets for startups that need them. * We can't do everything for free. Democamp, startupcamps, social events,. who do you think organizes this stuff? Go try it some time and see how much work it is, and then you'll realize that 300$ doesn't even cover the costs of putting it on. You are clueless. @Jevon – why are you getting so defensive? It’s obvious that you are embarking on a “for-profit” conference – all the power to you… I hope your efforts flourish. However, don’t be surprised if your readership rejects the idea. It’s a fine line you’ve decided to cross… building a community that promotes sharing, openness and for the most part not for profit information… than to come out with a conference targeted to the same audience with a price tag of $300+… may be a tough sell especially since most start ups are strapped for cash to begin with. @Jevon – why are you getting so defensive? It's obvious that you are embarking on a “for-profit” conference – all the power to you… I hope your efforts flourish. However, don't be surprised if your readership rejects the idea. It's a fine line you've decided to cross… building a community that promotes sharing, openness and for the most part not for profit information… than to come out with a conference targeted to the same audience with a price tag of $300+… may be a tough sell especially since most start ups are strapped for cash to begin with. Jevon’s right — $300/head doesn’t come close to covering the real cost of organizing something like this. Kudos to him and David for putting in the sweat to pull it together (and hey, if you want to flame the guy, at least have the grace to sign your name). Jevon's right — $300/head doesn't come close to covering the real cost of organizing something like this. Kudos to him and David for putting in the sweat to pull it together (and hey, if you want to flame the guy, at least have the grace to sign your name). Not sure what to say other than to point out that it really isn't a fine line,. it is not a line at all. Most startups understand the value of networking and learning from people who have been there before and they will understand what we are doing. Not sure what to say other than to point out that it really isn’t a fine line,. it is not a line at all. Awesome, very much interested in this event. How do you envision Day 1 being presented – will attendees have to choose between sessions? For the guys who want to attend and can’t afford it right now, pick up a quick gig on craigslist and put the money towards the conference. For the guys who want to attend and can't afford it right now, pick up a quick gig on craigslist and put the money towards the conference. You will have to choose a bit, yes., but there will be two “tracks”, Track 1 is focused on people who have never had a startup before and want to learn the ropes,. Track 2 is focused on people with startups, but who want to take it to the next level. Who’re the sponsors? I’d like to see a few good VCs throw their support behind the event. I hope you guys can nab ThomsonReuters as they pitched in over at TC50 – they can at least support their fellow Canadian startups. Some of the biggest questions some of my friends with a technical background come to me with are fairly basic – How do I actually start a business (from a legal standpoint, where do they go, how much does it cost, do they need it, etc), and if things go sour, how can I dissolve it? Some basic Business 101 topics would probably help – you’ve identified a few good ones there, but even basic book keeping, production adoption lifecycle, maybe identify some of the Canadian resources you can use early on – a really solid Canadian tailored How to Start a Tech Startup in Canada session – and hey maybe make it a handbook of sorts. Who're the sponsors? I'd like to see a few good VCs throw their support behind the event. I hope you guys can nab ThomsonReuters as they pitched in over at TC50 – they can at least support their fellow Canadian startups. Some of the biggest questions some of my friends with a technical background come to me with are fairly basic – How do I actually start a business (from a legal standpoint, where do they go, how much does it cost, do they need it, etc), and if things go sour, how can I dissolve it? Some basic Business 101 topics would probably help – you've identified a few good ones there, but even basic book keeping, production adoption lifecycle, maybe identify some of the Canadian resources you can use early on – a really solid Canadian tailored How to Start a Tech Startup in Canada session – and hey maybe make it a handbook of sorts. I’m in Northern Ontario launching a startup and would love to attend to do both a demo of our product and to learn the ropes, as you put it, and network with everyone else. May I ask how we might get more involved in this process? We’re planning to launch our alpha soon and a beta before the end of the year. If you’re interested, we’re at http://www.jaxified.com. I'm in Northern Ontario launching a startup and would love to attend to do both a demo of our product and to learn the ropes, as you put it, and network with everyone else. May I ask how we might get more involved in this process? We're planning to launch our alpha soon and a beta before the end of the year. If you're interested, we're at http://www.jaxified.com. Oh god, not Rick Segal. I’d love to come but there’s no way I’m paying $300 to hear that arrogant blowhard. Is there anyone more despised in Canadian VC circles than “Rick the Prick”? How about you replace him with someone more relevant and “human” like Amar from Extreme Ventures. Oh god, not Rick Segal. I'd love to come but there's no way I'm paying $300 to hear that arrogant blowhard. Is there anyone more despised in Canadian VC circles than “Rick the Prick”? How about you replace him with someone more relevant and “human” like Amar from Extreme Ventures. Having some “take away” material is a big deal for us and something we are working on. We will be updating the website next week with some new speakers and a list of workshops. What about doing a discounted price for a limited number of a startup’s team members? For instance, 2 team members for $200 or $300? I’d buy a ticket right now, but $600 for for two members is a serious drain on the budget. What about doing a discounted price for a limited number of a startup's team members? For instance, 2 team members for $200 or $300? I'd buy a ticket right now, but $600 for for two members is a serious drain on the budget. Sounds like a really great event.. Do you fellas have any plans on holding a similar event out west? Calgary maybe? I really think you are doing something great here that is worth more than the $300 for those that can utilize the networking opportunities. For those that are planning on going there to listen to a couple of talks and leave…well I can understand why $300 might be a little steep. May I suggest that you live stream the conference so that a startup doesn’t need to send several people to the conference but only the one or two people that can benefit from the networks there; the rest can check out the talks which is really all they want. I really think you are doing something great here that is worth more than the $300 for those that can utilize the networking opportunities. For those that are planning on going there to listen to a couple of talks and leave…well I can understand why $300 might be a little steep. May I suggest that you live stream the conference so that a startup doesn't need to send several people to the conference but only the one or two people that can benefit from the networks there; the rest can check out the talks which is really all they want. Dudes, this event is not listed on your shared calendar yet. My intention, and I suppose it really depends on how things go this year, is to move the conference to a different city each year or to at least find ways of getting the content in other places. Webcasts or simulcasts of some sort. Thanks Mahmoud– I really appreciate your feedback. rnrnAnd it really is about making the best of the opportunity, I agree. We are trying to provide the place for people to make that happen. Thanks Mahmoud– I really appreciate your feedback. And it really is about making the best of the opportunity, I agree. We are trying to provide the place for people to make that happen. Jevon, if you need any help for this event I’d like to take part in such a grassroots initiative. Jevon, if you need any help for this event I'd like to take part in such a grassroots initiative.